For every type of backyard, and for many particular species there are bird feeders to do the job. 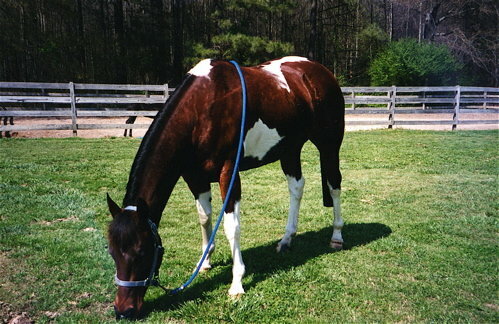 Obviously, large capacity feeders are better suited to larger yards with lots of space. 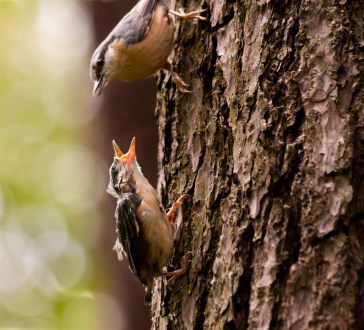 But if you have a small yard, or even no yard at all…you can still entice and attract many species of wild birds. Platforms or tray type feeders are extremely versatile as far as offering various foods. They’ll accommodate any birdseed mixes, suet, fruit, peanuts, or even mealworms. This means you can attr act different species according to seasons. 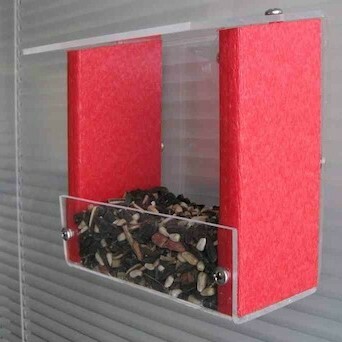 Window bird feeders are available in this tray style too, plus they allow for great close up views of your visitors. Hummingbirds for example, will also visit window bird feeders that are meant to hold nectar. In-Window bird feeders are also a great way to go if space is limited. These fit conveniently in most standard size windows, with the general feeding area right inside your room…talk about close up views! So even if you’re in an apartment with the smallest deck, there are bird accessories to invite feathered friends to your place. A small birdbath will also do wonders for attracting many species, in fact, it’s the best single way to bring birds home! Window feeders are excellent for close up views of feathered friends, but if you have the option, an in window bird feeder is even better! Bringing wild birds right into your home is is exciting, rewarding, and really brings a whole facet to wild bird feeding. 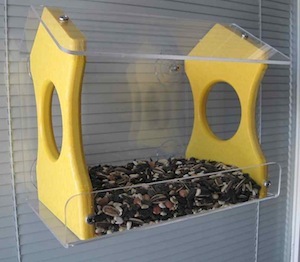 This in window bird feeder allows you to view the feeding birds through a clear panel. It actually sits inside your home and installs easily with dove-tailed, wooden side panels that slide out to fit most windows from two to three feet wide. Very thick wood side panels provide for great insulation and security. And, for added security, the design of this window feeder allows you to completely close and lock the window with the feeder in place. Filling and cleaning is simple from the comfort of your home. Made of plantation grown mahogany and hand crafted in the USA, it makes an awesome gift for any birding enthusiast or nature lover on your list! Whether the groundhog sees his shadow or not, you can sit back in the comfort of your living room or den and enjoy the promise of spring through feathered friends. With a platform type in window bird feeder, a whole new dimension to backyard birding is seen. First, the birds come to you. Instead of heading to the window, or grabbing binoculars, birds head right into your room! 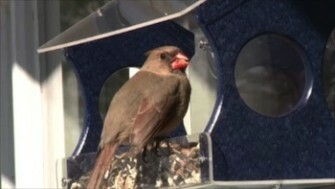 One-way mirrors in most window feeders allow you to view birds without disturbing them too. Second, the platform offers the advantage of variety. You’ll be able to attract more species by feeding different foods. Any seed mixes will work, as well as fruit, suet, peanuts, or meal worms. Peanuts and suet are sought during cold winter months as their fat and protein content are high. The extra calories help to keep birds warm. Third, filling and cleaning in window bird feeders is simple….right from inside your home. Most have trays that lift right out for simple cleaning, and filling, well…you don’t even have to drag the seed out to the yard! 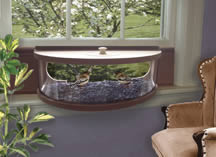 Most feeders fit windows from 24″ to 36″ wide, and side panels provide great insulation and security. For added security, they allow you to completely close and lock your window with the feeder in place. In window feeders make great gifts for seniors who love to watch birds…or for any birding enthusiast, a terrific one-time investment that will bring years or use and enjoyment.